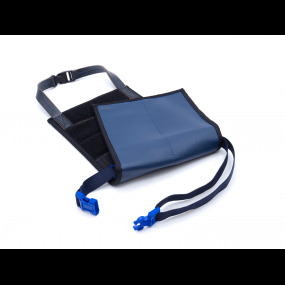 The Tank (0.5 L) : Also called "Recharge", it’s the MiniDive Pro without the breathing system called "regulator". Only few secondes are necessary to connect the regulator. The tank and its valve contain 100 L (3,53 cu ft) of compressed air needed for enjoy the autonomy up to 10 mins. 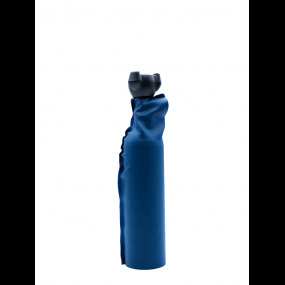 The tank is wrapped of a handmade navy blue protection. The M4S Hand Pump : This high technology hand pump allows you to fill yourself your own tank. Anywhere you are, only with your arms you are able to fill completely your MiniDive Pro up to 200 bar (3000 psi) ! "4S" means "4 Stages" which correspond to the number of cylinders in the pump tube, which makes pumping in high pressure easier. A little screw between the 2 handles allows you to set up the force of pumping effort. 12 mins average are enough to fill up you MiniDive Pro (0.5 L). Every M4S hand pump has a filter already mounted that filter humidity, moisture, oil residues and oil smell for a clean air. 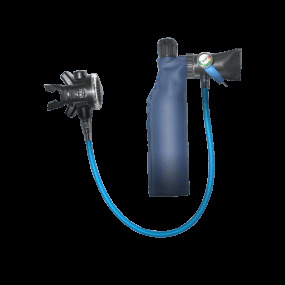 The connexion with the MiniDive Pro is very easy thanks to a quick clip, a manometer (gauge) on the integrated to the pump allows you to see in real time the pressure of the MiniDive Pro. It's an amazing product, however I advise for those that often dive to get the mini compressor, it will be more convenient to refill. And also a belt to hold few tank underwater would be great ! Waiting for new products. Kit idéal pour tout bon navigateur, surtout en Nouvelle Calédonie, rechargement un peu long (20 min avec des pauses) mais tellement utile sous l'eau en cas de pépins. je ne m'en suis servi que pour un petit carenage pour l'instant. Si j'avais eu cette bouteille quand j'ai eu un boute dans l'hélice il y 2 ans cela aurait surement été moins laborieux! The 5 to 10 mins autonomy of one tank are not enough for you ? Take other(s) tank(s), change a empty tank for a full one take only few secondes. The new M4S hand pump allows you to fill yourself your own MiniDive Pro (0.5 L) or tank (0.5 L) faster than the prevous hand pump. The maximal service pressure is 200 bar (3000 psi) and the pumping time is 12 mins average.